Delicious, healthy and keto Brussels sprouts gratin is topped with shredded gruyere and pork rind panko, then baked until hot and bubbly. Gratins, in general, are a proof of the genius of the French – you can take any vegetable, top it with a browned crust of melted cheese and buttery breadcrumbs, and it will magically turn VERY palatable. Indeed, I have a few other lovely gratin recipes on this blog. I find that coating vegetables in a creamy sauce, then topping them with cheese and (in my case) pork panko or almond meal and browning in the oven, is the most reliable way to get The Picky Eater to eat her vegetables and ASK FOR SECONDS. So I often make cauliflower gratin, zucchini tomato gratin (in summer), and broccoli casserole. Back to this Brussels sprouts gratin. I keep it keto by replacing the traditional breadcrumbs with pork panko. Almond meal should work pretty well too. The traditional cheese to use in a gratin is gruyere, but I’ve also made it with shredded white cheddar. Both versions are excellent. For an easy and tasty sauce, I simply mix sour cream with salt, pepper, and garlic. I then add the shredded cheese and mix that into the Brussels sprouts before topping them with Parmesan and pork panko and baking. Needless to say, this keto Brussels sprouts gratin will be a lovely addition to your Thanksgiving table. It’s actually one of my favorite Thanksgiving sides. But it’s great year round, and indeed I make it quite often. It makes a great side dish to almost any main course. I often serve it with easy chicken cordon bleu, baking both in the same oven. If you happen to have leftovers, they do keep well in the fridge for 3-4 days. Although the pork panko loses its crunch (but not its flavor!). Preheat oven to 400 degrees F. Spray a 2-quart baking dish with olive oil. 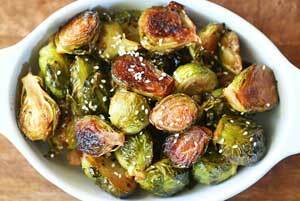 Place the Brussels sprouts in a large microwave-safe bowl. Add 1/4 cup water. Cover and microwave on high until tender-crisp, about 6 minutes. Meanwhile, in a small bowl, mix together the sour cream, mustard, kosher salt, black pepper, garlic and grated gruyere. Drain the Brussels sprouts and return to the bowl. Add the cheesy sour cream mixture and toss to coat. Transfer the coated Brussels sprouts to the prepared baking dish. Mix together the grated Parmesan and pork panko and sprinkle them on top. Lightly spray with olive oil. 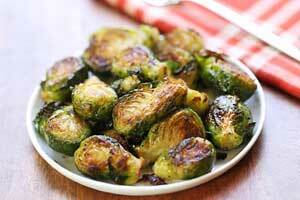 Bake the Brussels sprouts gratin until golden brown and bubbly around the edges, about 15 minutes. Serve immediately.